Open Lateral Credenza Is The Perfect Storage Solution For Your Organization Needs. It Keeps Your Office Essentials Visible And Accessible. Two Open Shelves Offer Versatile Storage For Supplies, Books, Binders And More. The Middle Shelf Adjusts In 1/2" Increments To Provide Maximum Flexibility. Lateral Credenza Also Includes Four Leveling Glides. Use As A Freestanding Unit Or Combine With The Lorell Two-Drawer Box/File Lateral Credenza Or Sliding Door Credenza (Both Sold Separately). The Lorell Credenza Seat Cushion To Transform The Top Into A Comfortable Seat Is Sold Separately..
Open Lateral Credenza Is The Perfect Storage Solution For Your Organization Needs. It Keeps Your Office Essentials Visible And Accessible. Two Open Shelves Offer Versatile Storage For Supplies, Books, Binders And More. 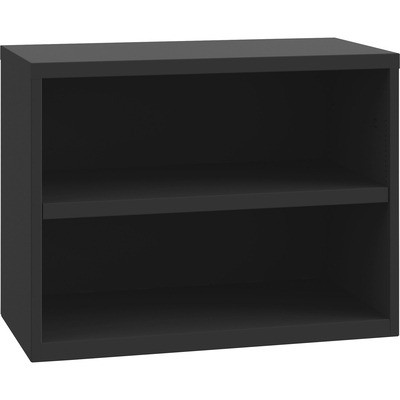 The Middle Shelf Adjusts In 1/2" Increments To Provide Maximum Flexibility. Lateral Credenza Also Includes Four Leveling Glides. Use As A Freestanding Unit Or Combine With The Lorell Two-Drawer Box/File Lateral Credenza Or Sliding Door Credenza (Both Sold Separately). The Lorell Credenza Seat Cushion To Transform The Top Into A Comfortable Seat Is Sold Separately.